This view is dedicated to facilitate your standup meeting. It brings all the relevant information about your sprint and gives your team the ability to inspect & adapt their sprint and to organise themselves on what they accomplish today. 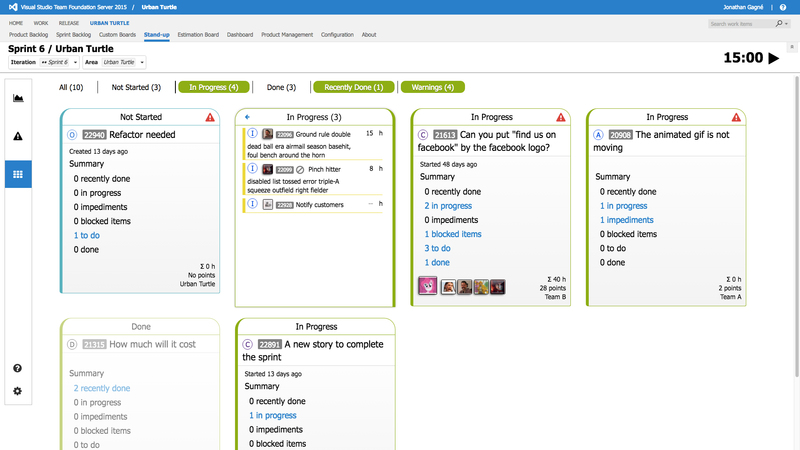 At the top of the screen, select your current iteration and area, the one you want to talk about during your standup. You also have the ability to start a timer to help your team respect the 15 minutes timebox for the daily standup. With this information you have everything you need to answer the 3 questions for your standup. What did I do yesterday to help my team to meet the Sprint Goal? What will I do today to help my team to meet the Sprint Goal? Do I see any impediments preventing me or my team to meet the Sprint Goal? 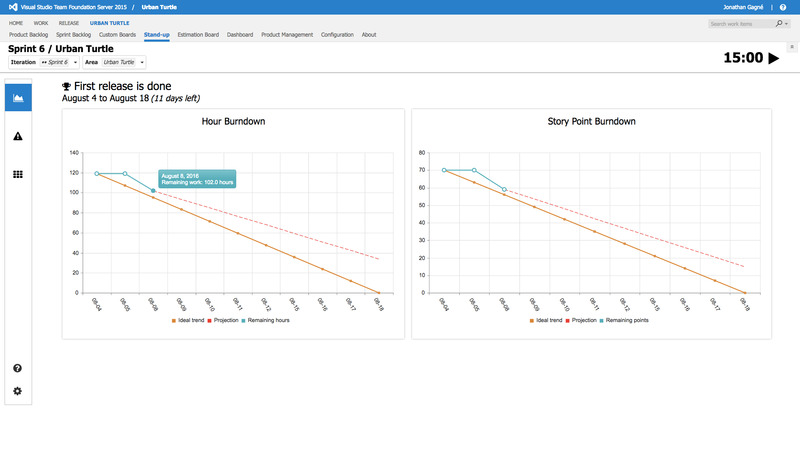 This section presents the Hour Burndown and Story Point Burndown graphs giving you an overview of the progression of your sprint. It also emphasizes on your sprint goal and the time remaining to achieve it. This is the go-to screen when starting your daily and inspect your progression toward your goal. 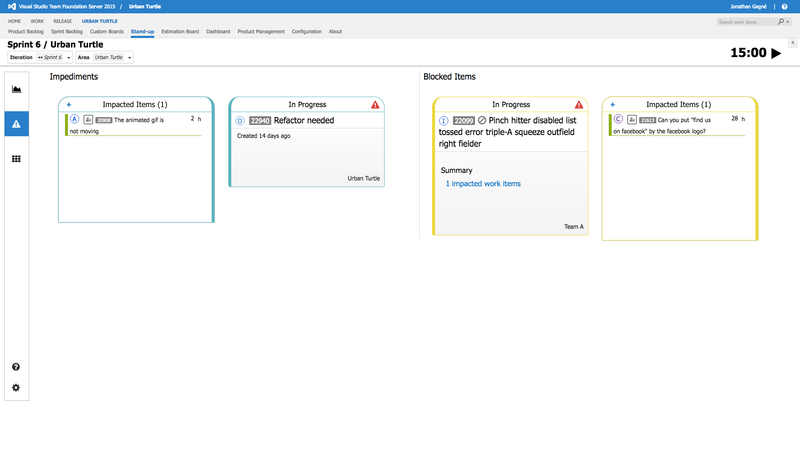 This section displays the impediments (scrum template) and blocked tasks that might affect or impair your sprint. It alerts team members and your Scrum Master to take action rapidly to keep things running smoothly during the sprint by encouraging the synchronisation and collaboration. Tip: To block a task, just choose “Yes” from the Blocked field in the task editor. This section presents a story centric view of your sprint. Instead of creating a view that displays what each member is working on, we choose to focus on the stories in order to generate more collaboration between team members. This is the “walk the board” approach for the standup. Each story presents a summary of its tasks. You can click on the summary links to flip the story card and display corresponding tasks. The sum of remaining task hours gives you an insight of the progression. On the story card, the avatar of the story owner (if any) and the collaborators assigned to a task are displayed to invites them to talk about the story. Filters are available to help you find specific stories but by default, they will show you what’s currently in progress, the recently done, and the warnings. If your team is up to date before the standup, this is more likely to be all the filters you need to activate. The configuration of the standup view is quite simple. To help Urban Turtle figure out under which filter in the stories sections a specific stories should be, you just need to map your Work Item TFS Statuses to this vocabulary (Not Started, In Progress, Done) and voilà!